Treasury Secretary Timothy Geithner's first plan only mentioned using the bailout funds to support the private-public partnership, and he was vague on the details of how that program would work. WASHINGTON — Treasury Secretary Timothy Geithner could announce as soon as Monday his much-anticipated plan to get toxic assets off the books of the country's struggling banks, administration and industry officials said. The plan will use the Federal Reserve and the Federal Deposit Insurance Corp. to make the resources of the government's $700 billion financial rescue fund go further, the officials said Friday. Geithner is being forced to tap the Fed and the FDIC for support because the prospects for getting additional money from Congress for the bailout effort have dimmed significantly given the recent uproar over millions of dollars in bonuses provided to troubled insurance giant American International Group Inc., the largest recipient of government support. One program will use the bailout fund to create a public-private partnership to back purchases of bad assets by private investors. A second portion of the plan will expand a recently launched program being run by the Federal Reserve called the Term Asset-Backed Securities Loan Facility, or TALF. That program is providing loans for investors to buy assets backed by consumer debt in an effort to make it easier for consumers to get auto, student and credit card loans. Under Geithner's proposal, this program would be expanded to support investors' purchases of banks' toxic assets. When Geithner announced the administration's overhaul of the financial rescue program on Feb. 10, he only mentioned using the bailout funds to support the private-public partnership, and he was vague on the details of how that program would work. The initial proposal was widely panned by investors, who were disappointed in a lack of specifics. The Dow Jones industrial average tumbled 380 points on the day the original program was announced. Geithner's new plan would tap the resources of the Fed and the FDIC to attack what many analysts see as the major failing of the bank rescue effort so far, the failure to rid banks' of more than $1 trillion in bad loans and other toxic assets weighing down their books. As a result, banks have been unable to shake off the effects of the worst financial crisis to hit the country in seven decades. While the administration included a placeholder in its budget request last month for as much as an additional $750 billion in rescue funds, more than doubling the current commitment, the uproar over the AIG bonuses has underscored the dim prospects that Congress would vote to bolster the size of the current fund. The effort to deal with toxic assets is the latest in a string of initiatives the administration has put forward to deal with the financial crisis that had made it hard for consumers and businesses to get loans and has deepened the current recession, already the longest in a quarter-century. The administration has put forward new programs to deal with mortgage foreclosures, expanded efforts to bolster lending to small businesses, launched with the Fed the TALF to unfreeze markets that support credit card, auto and student loans and also begun a so-called stress test of the country's 19 largest banks to make sure they have sufficient resources to withstand an even more severe recession. A key unknown is whether the new plan to deal with toxic assets will succeed in attracting private investors to start buying the bad assets. Investors have fled these markets, scared off by the billions of dollars of losses that have already incurred on everything from mortgage-backed securities to consumer and business loans. Hedge funds and other big investors may be even more leery of accepting the government's enticements to purchase these assets for fear of the imposition of tighter government restraints in such areas as executive compensation in the wake of the uproar over AIG. 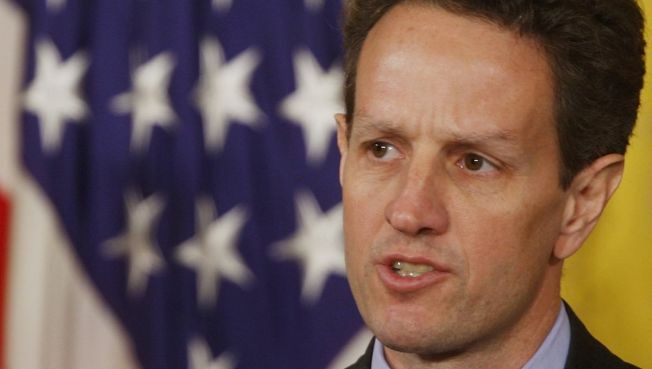 In addition to unveiling his plan for toxic assets, Geithner is also expected to put forward next week the administration's proposals to overhaul the government's current financial regulatory structure. President Barack Obama said this week that this plan will include a proposal to give the administration expanded authority to take control of major troubled institutions that are deemed too big to fail because their collapse would pose a risk to the entire financial system.